We are your online source for The Legend of Sherwood Clothing. Here we have the Outlaw shirt, Locksley Pants, Robin of Locksley Gambeson, Locksley Boots and the Robin Hood Belt. This all you need to be The Legend of Sherwood. This medieval shirt is perfect for an outlaw living in Sherwood Forest. Made from cotton with leather lacing down the front and button cuffs. 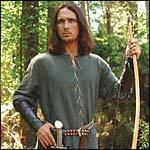 Throughout the ages, no one character of English folklore has spawned more tales of romance and chivalry than Robin of Locksley, known throughout the realm as Robin Hood. This heavy two-piece garment consists of a corduroy undershirt with padded and studded sleeves and a quilted, sleeveless gambeson.